The Gower Brothers, Andrew, Paul, and Ian, were the original creators of RuneScape. They made RuneScape in their apartment in the late 1990s and early 2000s, releasing the game in January 2001. Here, they are back, but this time as characters. They need your help - their cabbage farm is no longer growing cabbages. Can you fix it? Will the Gower brothers continue their life as cabbage farmers, or will they go onto something greater? Will Zaros make a guest appearance? Speak to the Gower Brothers in the cabbage farm south of Varrock. Begin by speaking to one of the Gower brothers in the farmhouse south of Varrock. The Gowers' cabbage patch has stopped working and they require you to figure out why. Search the crate in the room due west of the Gowers to find a pure essence. Right click on the essence and flip it, revealing the life rune of legend (or in this case, the early 2000s) . Search the scarecrow in the cabbage patch southwest of the Gowers to obtain a cruciferous mounting . Search the water barrel just outside the cabbage patch to find a brussel sprout . Go east to the rat pen and search the food trough to obtain a broccoli root . Spin the broccoli root on the spinning wheel in the Gowers' room to create a string, attach the brussel sprout to the cruciferous mount to obtain an unstrung amulet, and then string this amulet with the broccoli string. 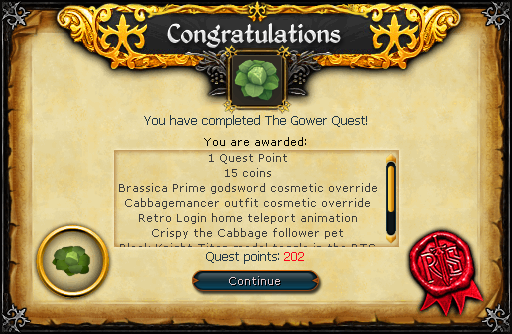 Finally, enchant the amulet with the life rune to obtain a cabbagespeak amulet . Speak to Crispy the Cabbage in the cabbage field while wearing the cabbagespeak amulet to learn that the cabbages are rioting until they get what they want: partyhats. Thankfully, the creators of Runescape live next door and they will give you three pink partyhats. Give these to the cabbages. 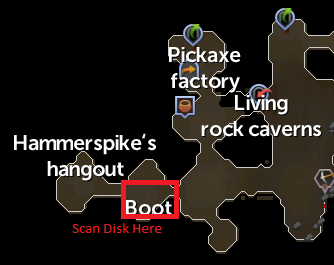 A satisified Crispy will jump into your backpack and tell you that the problem lies "behind sceneries" and can be reached using a disk of returning in the Dwarven Mines. Speak to Andrew to obtain a disk. Head off to the dwarven mines and left click "scan" at the noted location to be teleported into the black hole. While the black hole is completely black minus your character, it still has some objects that can be interacted with. Directly north of your starting position in the black hole there is a table. Searching it yields a pet rock. Look under the table (right click) to find a basket of oranges. Take one and eat it to find a key. West of that is an unusual shape which turns out to be a skeleton missing its head. Use the pet rock on the wall north of the unusual shape. Use the key on the bumpy wall to the east to get a tinderbox. Light the scary wispy thing northeast of the table on fire to find a skull. Use the skull on the unusual shape to reunite the skeleton and open the gate of Lloigh-Enn. Speak to Thordur at the desk and ask to be taken away. When you arrive, speak to Spiral Orb the purple spider to the northwest. The problem behind the cabbage famine is the destruction of the life altar in the basement. The pieces have been spread out among three individuals. Go northwest to speak to Lucien, who will reveal that the Wise Old Man took his piece. Jump through the bank portal to the west of Lucien and speak to the cleric (Claire Hick), check out the bank vault, and speak with Ernie. Leave the bank headquarters and run straight south and find Romeo. He will agree to distract the cleric only if he gets some love advice. Run west and speak to all five God Wars Dungeon bosses to get advice. Return to Romeo, who will teleport away. Speak to Sphenischev, the penguin at the bar just northeast of Romeo, who will agree to crack the safe. Speak to Tim and Crunchy just to the east and get five cups of tea from the bartender. Give them to all the environment artists surrounding the bar. Talk to Tim and Crunchy again to let them know you have accomplished this. Run east and speak to Guthix, who will only agree to distract the guard if you get him an acting job. Talk to the cabbages north across the bar and convince them to take on Guthix and return to Guthix to let him know of your success. Enter Lucien's portal and talk to Claire Hick so that she can be distracted by Romeo. Talk to the bank guard to have Guthix distract him. Check out the vault door to have it blown away by Tim and Crunchy. Attempt to open the bank safety box so that Sphenischev assists you. You will open the vault and be rewarded Life Altar piece 1. Talk to the Chaos Elemental, located south of Lucien. 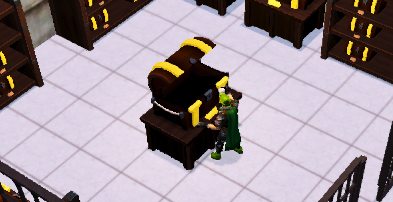 He saw the piece of the life altar blown into the Grand Exchange. Enter the portal located next to the pipes south of The Chaos Elemental. In front of the desk to the north, there is a Grand Exchange puzzle. There are three different types of pipes of different size. 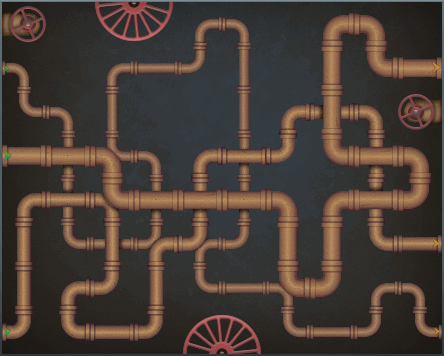 Arrange the pipes to connect one end to another based on size. You will be awarded Life Altar Fragment 2 when this is all completed. Talk to Thok, located west of Lucien, and ask him about his piece. He will tell you to ask Max about it through the portal north of him. Talk to Max. To get his piece, you will have to max out three unreleased skills: bankstanding, riding, and sailing. Open the first door to the north to enter the riding room. To gain levels, follow the instructions at the top of the screen using the minigame tab. This is similar to the artisan's workshop. Alternatively, you could just stick with one setting and wait longer to get level 99. Once you are level 99, leave and enter the sailing room on the south side of the hallway. Both of your hands should be free. Gain levels by firing on other "battleships" clicking on areas of bubbling water, and exploring desert islands. Focus on desert islands and bubbling water, as these grant more experience. Once you have maxed sailing, enter the only other available door to find the bankstanding room. This is the easy one--all you have to do is stand in the bank. You will occasionally be forced out of the bank, so when this happens go back into the bank. Speak to Max, who will give you his piece of the altar. Go through the altar west of the Chaos Elemental's altar. It should be the one with the grass and flowers around it. Use all three pieces of the life altar on the broken altar. This will summon the Black Knight Titan! He will explain that he killed the cabbagemancer, causing the life altar to go out of balance and explode. Fight the Black Knight Titan when you are ready. He should not be terribly difficult for the average player and has hitpoints that scale based on your combat level. After being killed, he will keep rejuvenating. After the second kill, Crispy the cabbage will go look for help. After the third kill, the Gowers will arrive and attempt to prevent his rejuvenation. The titan will need to be killed three more times to be subdued. Talk to the Gowers and convince them to fix the life altar and act as its keepers. Congratulations, Quest complete! After the quest you can obtain three experience lamps. If your all of your skills are above level 10, you can talk to Ian for a 250 experience lamp that can be used for a large amount of selected skills. If all of your skills are above level 30, you can speak to Paul for a 1500 experience lamp for the same selected skills. If all of your skills are above level 50 you can speak to Andrew for a 12000 experience lamp.